No-bake gingerbread truffles made with almond flour, nut or seed butter, a hint of molasses and gingerbread spices. Vegan, grain-free, paleo-friendly and ready in 30 minutes. Line small baking sheet with parchment paper; set aside. In medium bowl whisk together almond flour, coconut sugar and spices. Stir in nut or seed butter (make sure it’s well stirred prior to adding), molasses, and slowly add milk until mixture comes together. Mixture should be easy to roll and not crumbly. Using small cookie scoop or 1/2 round tablespoon, shape dough into little balls – you should get about 14. Place dough balls on lined cookie sheet; place in freezer for 15 minutes. During the last few minutes while the cookie dough is chilling, prepare the chocolate coating: In a small microwave safe bowl, melt chocolate chips with coconut oil in 20 second increments, stirring in between until fully melted. Alternatively you could also melt in a small saucepan over medium-low heat, or if your toaster oven has a “warm” function that will also work. No matter which method you choose, be careful not to burn. Remove tray with cookie dough from freezer; use a spoon to dip the cookie dough balls into the chocolate, setting back onto parchment paper. The chocolate should set rather quickly with the cold cookie dough. 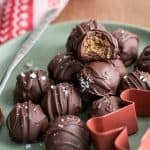 Drizzle any remaining chocolate over top of the truffles and top with sea salt flakes. Pop back in fridge to speed up process if desired. Store cookie dough truffles in covered container in fridge. Enjoy!